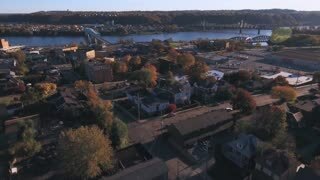 A slowly moving forward aerial shot of a typical Western Pennsylvania small town in the Autumn. Ohio River in distance. Pittsburgh suburb. 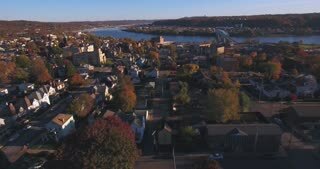 A slowly moving backward aerial shot of a typical Western Pennsylvania small town in the Autumn. Ohio River in distance. Pittsburgh suburb.